In separate clinical trials, a drug called ocrelizumab has been shown to reduce new attacks in patients with relapsing remitting multiple sclerosis (MS), and also new symptom progression in primary progressive MS. Two studies conducted by an international team of researchers, which included Dr. Amit Bar-Or and Dr. Douglas Arnold from the Montreal Neurological Institute and Hospital of McGill University, have discovered that ocrelizumab can significantly reduce new attacks in patients with relapsing MS, as well as slow the progression of symptoms caused by primary progressive MS. In one study, 732 patients with primary progressive MS were randomized on a 2:1 ratio to receive either ocrelizumab, a humanized monoclonal antibody that depletes CD20+ B cells, or a placebo. The proportion of patients with 12-week confirmed disability progression was 39.3 per cent with the placebo versus 32.9 per cent with ocrelizumab. After 24 weeks, the proportion with confirmed disability progression was 35.7 per cent with placebo versus 29.6 per cent with ocrelizumab. By week 120, timed 25-foot walk worsened by 55.1 per cent for placebo versus 38.9 per cent for ocrelizumab. Patients given ocrelizumab were also found to have fewer new brain lesions and less brain volume loss than those given the placebo. Researchers also tested ocrelizumab in two separate studies of patients with relapsing remitting MS, one a group of 821 and the other 835. In both studies, patients were randomized on a 1:1 ratio to receive either ocrelizumab or an already established treatment for relapsing MS: subcutaneous interferon-beta, injected three times weekly. Compared to the placebo, relapse rates in patients given ocrelizumab were 46-per-cent lower in one study and 47-per-cent lower in the other. According to an announcement issued on January 9, 2017, Dr. Ottoline Leyser (photo) has been named recipient of the 2017 FEBS|EMBO Women in Science Award. The award recognizes outstanding achievements of female researchers in the life sciences in the past five years. 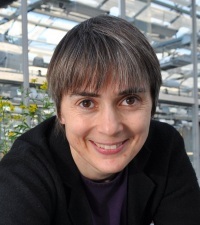 Dr. Leyser, who is Director of the Sainsbury Laboratory at Cambridge University, UK, receives the honor for her work on the evolutionary, developmental and biochemical mechanisms that enable plants to respond and adapt to environmental changes. “It’s a great honor to receive this award,” says Dr. Leyser. “It’s both a joy and a privilege to work in research science, especially in molecular biology, where technological advances are currently opening up so many opportunities for discovery. To make the most of these opportunities, science needs diversity, and initiatives like this award have an important part to play in opening the doors of the laboratory to everyone." Professor Leyser’s focus on understanding how plants respond to their environment led to her discovery of the mechanism of action of the plant hormone auxin and the identification of a second group of plant hormones known as strigolactones. She has formulated a model of how the two hormone systems interact to regulate plant development. Her current work aims to elucidate the mechanisms underlying this model. In order to tackle this question, she has added computational modelling to the more traditional array of techniques used to study this complex system. Dr. Leyser is also an outstanding role model for future generations of researchers, having successfully combined academic research, parenthood, and other activities.